Kevin Mohr, Chief of Interpretation at the Washita Battle Historic Site, speaks to Kiwanis/Senior Citizens. 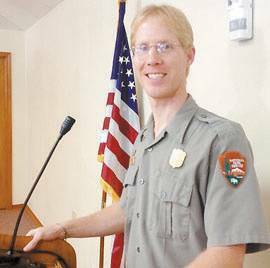 By Pat VerSteeg — This past week Kiwanis/Senior Citizens heard an interesting program about the National Park System. Tucker Blythe, Washita National Historic Site Superintendent, introduced Kevin Mohr, Washita Historic Site Chief of Interpretation. Blythe noted that this is the National Park System’s centennial year and the theme for the year is “Find Your Park.” All across the nation the National Park System (NPS) has been promoting special events to commemorate this centennial milestone.